Sitting on the precarious join between the North American and Eurasian tectonic plates (which are growing apart an inch a year), Mývatn’s otherworldly landscape is shaped by high volcanic activity. Named after the volcanic lake at the centre, this is a prime example of the extreme terrain that Iceland is known for. Whether you’re looking for rare wildlife in the Mývatn-Laxá Nature Conservation Area, or carefully traversing the bubbling pools and steaming craters of the nearby Kefla volcano, you’re never short of natural wonders to explore. A good way to see everything is to follow one of the many popular hiking trails. Start on the east side of the lake and move north, beginning your journey at Dimmuborgir and ending it at the Krafla area. 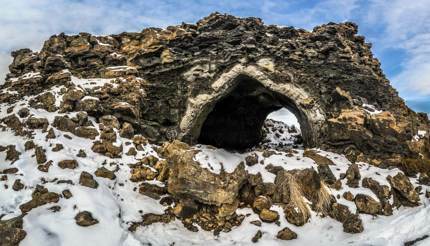 Start your hike at the Dimmuborgir lava formations, thought to be the product of a massive volcanic eruption 2,300 years ago. The resultant dark brown, craggy sculptures have earned the name ‘the dark fortress’, on account of the odd, naturally formed tunnels and alcoves throughout the structures. In Icelandic folklore it’s known as the place where Satan fell to earth, cheerfully nicknamed “The Catacombs of Hell”. According to more modern, local myth, the formations are also home to the Yule Lads – Icelandic folklore trolls with catchy names such as Door Slammer and Sausage Swiper. Icelanders are rather obsessed with elves and trolls, but with landscape this unusual it’s not surprising they believe magical forces lurk within it. Just north of Dimmuborgir is the volcanic crater, Hverfjall. At just 396m (1,300ft) tall, it’s easy to climb even in the snow; your reward at the top is one of the largest tephra (volcanic rock fragments) rings in the world. It’s possible to walk all around the crater rim, but doing so relies on the weather being cooperative to ensure a good view, something that is unlikely given Iceland’s temperamental climate. One word of advice – you must stick to the designated paths, as the ecosystem here is delicate. Picture the scene. You’re sitting in your swimwear, snow dusting the ground around you, and the air temperature is a brisk -5°C. Despite all of this, you’re sweating and trying to cool yourself down. Welcome to the strange world of the Mývatn Nature Baths, located just north of Hverjfall. The water here is drawn from a borehole that burrows 2,500m (8,202ft) into Iceland’s tempestuous ground, heated by the geothermal energy that comes from being so close to the volcano. It exits the ground at a toasty 130°C (266°F), cooling to around 36-40°C (97-104°F) by the time it reaches the surface, providing a naturally heated outdoor swimming pool. There are even a few steam baths, rooms built over vents in the ground where natural steam creates 50°C temperatures and 100% humidity. It also happens to be astoundingly beautiful, in a mysterious, ethereal kind of way. With pale blue water shrouded in mist, and a backdrop of towering mountains capped with snow in the winter, it’s not hard to see why it’s such a popular spot. A few kilometres North-East from the Nature Baths, you’ll find that the ground itself hisses and bubbles, ejecting steam that can be seen for miles around. This is Hverir, one of the largest geothermal areas in Iceland, and it’s a sight to behold. The frozen ground is distorted by hot mud as 200°C (392°F) steam is ejected from the earth’s belly in noisy plumes. It also has a very distinctive rotten-egg smell, thanks in part to the copious amounts of sulphur present in anything that is heated by geothermal energy. Not only does it look like a witch’s cauldron, but it also smells like one too. The final stop on this hike is the Krafla Caldera, about 10km (6 miles) north of Hverir, but as you approach you’ll begin to notice the colourful lava field all around, sulphur painting the ground shades of green and yellow in between the bubbling mud pools. Be sure to stay to the paths, or you’ll find the soles of your shoes melting as you walk through. 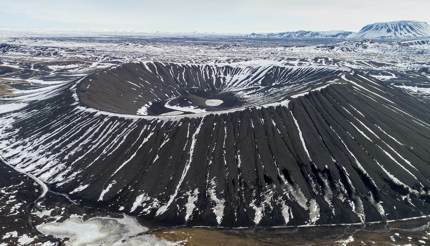 Once at the top you’ll find the Viti crater, a name that means ‘hell’ in Icelandic. However, despite this ominous description, the crater contains an aquamarine lake – the uncharacteristically bright colour is a result of both the sulphur in the water and the contrast with the black volcanic ash that surrounds it. At 25°C (77°F) the water is lukewarm, although the cold air temperature makes it a chilly experience. However, if you want to tick ‘swimming in a crater’ off your bucket list, you can go for a dip in the sulphurous, blue-green waters of hell. You’ll also notice a number of pipes and power lines dotted around the volcano. These are from the nearby Krafla power plant which harnesses this geothermal energy below the ground for electricity and heat. 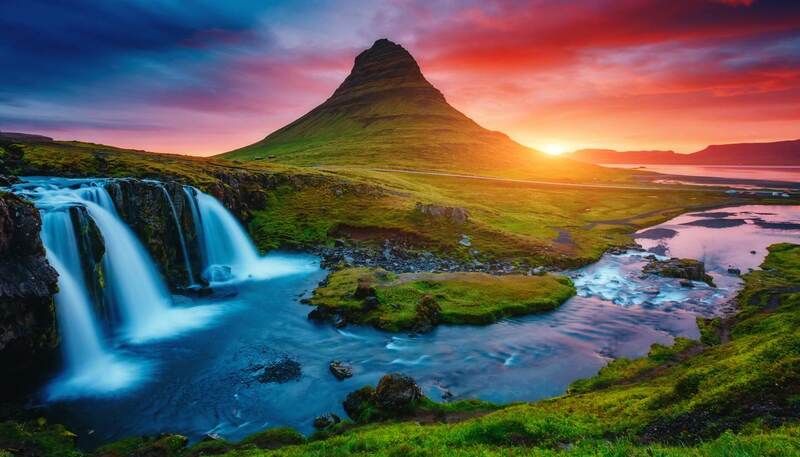 In fact, the majority of Iceland’s energy comes from renewable sources such as geothermal and hydroelectric (from the country’s waterfalls, glaciers and rivers). At 66 degrees north and with minimal light pollution, Mývatn is an excellent place to catch nature’s most well-known light show, the Northern Lights, from November to February. Most of the time you’ll be treated to an emerald green shimmer, as this is the most common colour. However, the lucky ones will see vibrant reds, deep blue and rich purples, depending on the solar activity. For Instagram-worthy pictures, set your camera on a tripod and use a long exposure time, 20 seconds minimum. There’s a saying in Iceland – “If you don’t like the weather, just wait five minutes” – and the claim can be easily substantiated. From high winds to pelting rain, blinding snow to bright sunlight – it’s not uncommon to experience four season’s worth of weather in one day. The temperature is consistently chilly for many people though, averaging 0-11°C (32-52°F) throughout the year, and the rainfall is relatively consistent. Rather than the weather, the main factor in deciding when to visit should be the daylight hours. 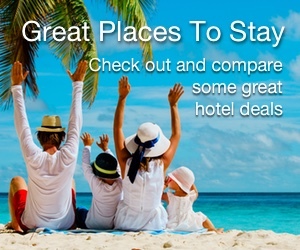 The tourist season starts from mid-May to early September, during which the daylight hours are extremely long. If you are in Iceland on June 21, then you will see the so-called ‘midnight sun’ where the country experiences almost 24 hours of daylight. In contrast, the winter months have extremely short days, with December 21 being the shortest at less than four hours of daylight. There are advantages and disadvantages to both seasons. Most visit during the summer season because of the weather and also to get spectacular views of the volcanic lakes, which are frozen over in the winter. However, do note that the waters around Mývatn are breeding grounds for bugs (Mývatn means ‘midge’ in Icelandic). In winter, many of the volcanic lakes freeze over and the temperatures remain low. On the upside, this is the best chance to see the Northern Lights and overall prices tend to be lower as it’s the off-season. Hire a four-wheel drive and keep a spade in the boot to dig yourself out of the snow, particularly in winter. Check road conditions before you set off, and if in doubt, ask a local. Food is delicious and hearty – try local specialities arctic char, Geysir bread (baked in the ground) and skyr (an Icelandic yoghurt) at the Cowshed Cafe, where the farm’s dairy cows hang out in the next room. Wine and spirits are expensive. 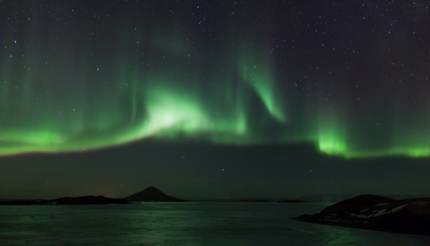 The Northern Lights are best viewed from November to February, on clear nights. The aurora forecast should give you a heads-up. Icelandair connects Reykjavik with many major cities across the globe.